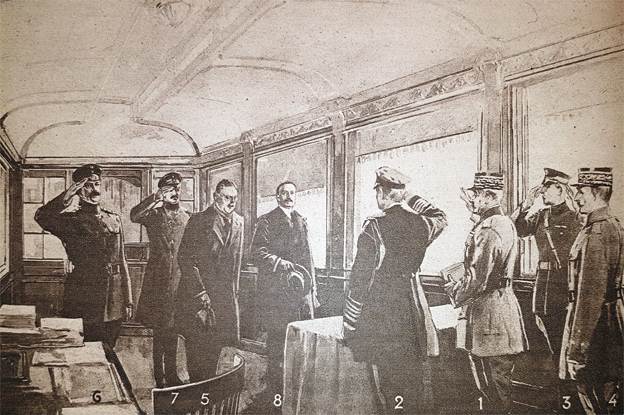 Plenipotentiaries in carriage 2419D: 1- Foch; 2- Wemyss; 3- American delegate; 4- Weygand; 5- Erzberger; 6- von Gundell; 7- von Winterfeldt; 8- Oberdorff. Not shown are the German vessel captain Wanselow, British Rear-Admiral Hope and the indispensable interpreters, Commander Bagot, officer-interpreter Laperche, the liaison officer and the German interpreter, Captain von Helldorff. The press, kept on the sidelines, was not provided with photographs and therefore had to reconstitute the events as it could. It made several mistakes in the process. In this image, for example, an American delegate and General von Gundell are shown when they were not in attendance. The carriage ceiling was too high and the layout of the furniture layout was not true to reality. On other drawings, General von Winterfeldt is wearing a pointed helmet as he was in an older photograph published in the newspapers, but not on that occasion. © Paris musée de l’Armée. At the first meeting, Foch asked the Germans: “What is the purpose of your visit?” Erzberger responds: “We have come to receive the proposals from the Allied Powers to reach an armistice […]”. Foch said: “I have no proposals to make”. Oberndorff stepped in, Foch responded to him just as coolly, then announced: “I’m here to answer if you request an armistice. Are you requesting an armistice?”. Erzberger then specified: “We request the armistice”. Foch responded: “We will therefore read you the conditions laid down by Allied governments.” Weygand read it out, the interpreter translating along the way. 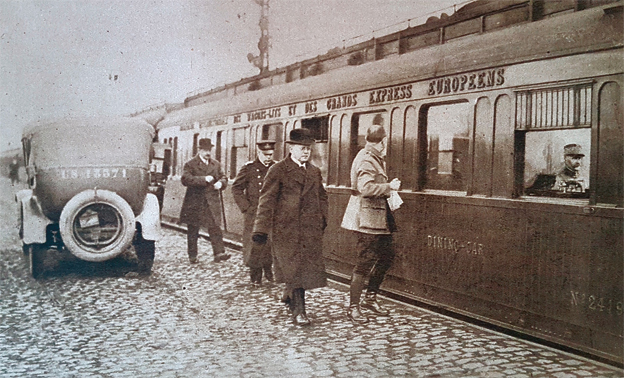 The German delegation then had 72 hours to communicate the conditions to Germany and give its answer. Its room for negotiation was minimal. 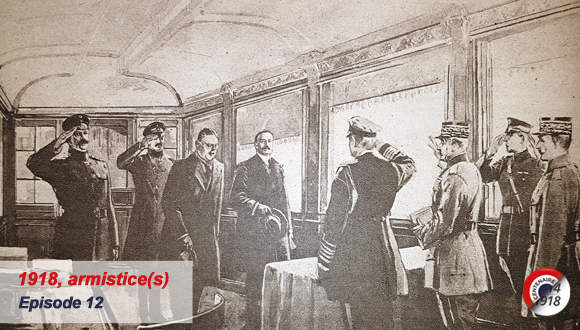 On 10 November, just after 9:30 p.m., the German Chancellor addressed the first telegram to Foch. He accepted the armistice conditions communicated to him on 8 November. According to Erzberger, the message was authenticated using code 3084. A second encrypted telegram was also handed to the German delegates. On 11 November, at 2:15 p.m., the plenipotentiaries came together in wagon 2419D. The Germans discussed each article and secured a few slight changes. Around 5 a.m., the agreement was signed. Only the last page was quickly typed in several copies by Henri Deledicq (1897-1985), one of Foch’s private secretaries, and signed with the six names: F. Foch. R. E. Wemyss Admiral, Erzberger, A. Oberndorff, Winterfeldt, Vanselow. The agreement contains thirty-four articles specifying in particular the official ceasefire time, 11 a.m., Paris time. A version is kept at the Defence Historical Service. 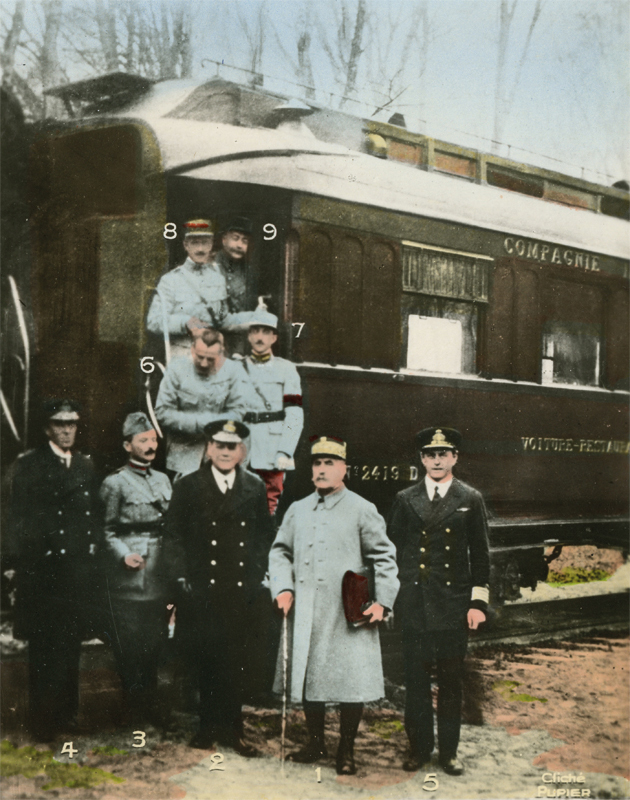 The armistice was extended three times after the signing of 11 November, on 13 December 1918, on 16 January 1919 and on 16 February 1919 (for an unlimited period), until the signing of the Treaty of Versailles on 28 June 1919. These extensions were signed in the 2419D wagon located in the town of south-west Germany, Triers, near the Luxembourg border.